Canadian Armored Squadron (Confident, trained), "Monty's Pythons", 22nd Armored Regiment "Canadian Grenadier Guards", 4th Canadian Armored Division, 2nd Canadian Corps (attacker). Rifle Platoon of 7 Rifle/MG teams, PIAT and Mortar. 2 Aufklärungs Platoons 5 MG Teams on 3 halftracks. Mission: Hasty Attack. 4 objectives are placed. One objective is removed by the attacker after deployment. Attacker has half his platoons in reserve; while the Defender has half his platoon in delayed, scattered reserve. Either side wins by capturing the opposite objective. Picture taken from the "North" edge. The road runs east to west. Most of the hills are only about 6-8 feet high, providing cover, but not hiding any vehicles. The Board: The breakout region near Gouvix. Best described as, put on your severe Scottish brogue as “the moooor”. Small rises everywhere on the board. Most of them ranging about 5-8 feet high, some of the rises have rough edges to qualify as a bog check, otherwise the slopes were classed as slow going. The rises provide some cover but only a few are tall enough to truly hide behind. 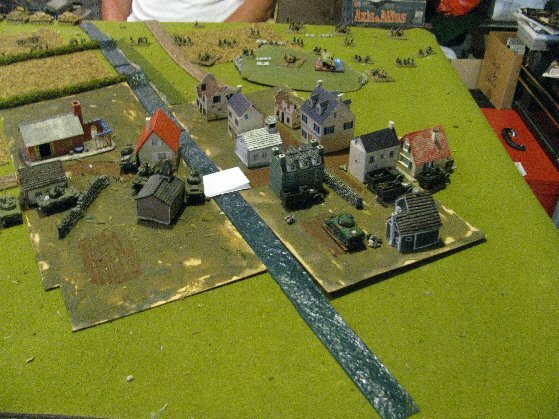 A stream starts from the south and meanders to the east edge of the board. A road runs from the middle of the east edge to near the middle of the west edge. Captain Palen paused as he was interrupted to the noise of a chain being clattered around a large tin as Lieutenant Jones drove up. “Lieutenant Jones, good to see you are up and about,” Captain Palen called out sarcastically. “And you feel better instead having your driver following you about with a noisemaker?” Queried Captain Palen. Queue sardonic humor from the crowd. Queue cheer from the crowd. “Armed with Panthers, Assault Guns and other Panzers” continued Captain Palen. “Now gentlemen, do any of you know what the objective is?” Asked Captain Palen. “Yes, Lieutenant Idle,” gritted Captain Palen. Lieutenant Jones raised his hand. “Yes Sir!” Saluted Captain Palen and his men. Monties Pythons had 4 Platoons on the board. As I was on defense, I chose the Rifles, Sextons, and the Sherman Troops ‘A’ and ‘B’. The Sextons deployed behind a high ridge in the southwest corner of the board. In the north, hull down but visible, was Troop ‘A’ with 3 Shermans and a Firefly. In the south, covering the southern objective, were the tanks of Troop ‘B’. Dug in and spread out around the center objective was the Rifle Platoon. 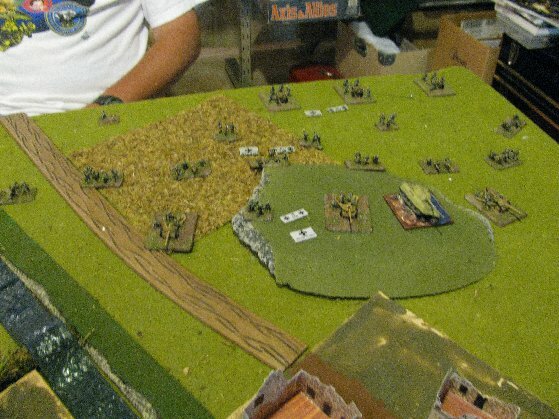 The Germans had 3 Platoons on the board. In the north, Troop ‘A’ faced a Sturmgeschutz battery, reinforced by the 2iC in a Panther. They too, were in hull down position, ready for a long exchange of gunfire. In the center, across from the Rifle Platoon was a Platoon of Panthers, and in the south, facing Troop ‘B’, another Platoon of Panthers. In the north, the Sturmgeschutz, and the Panther 2iC, were content with their position and fired at Troop ‘A’ to no effect. 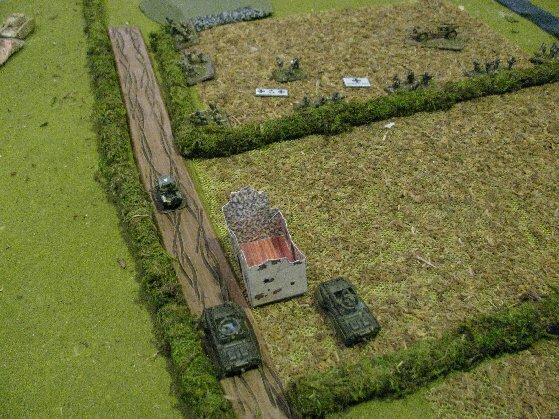 In the Center and South, the Panthers moved forward, taking advantage of the knolls for cover where they could. None of their shots hit. Monty’s Pythons fired back. But only the Fireflys could cause damage, but failed to find their marks. The regular Shermans contented themselves with smoking the Sturmgeschutzs and a couple of the Panthers. The Sextons ranged in, and bailed a center position Panther. German reinforcements arrive, an Aufklärungs Platoon. It positioned itself on the east west road, and ran 18 inches down it. The bailed Panther remounted, but another bogged in the creek. 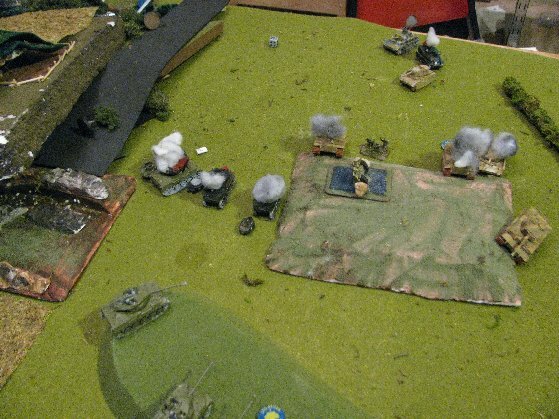 The Sturmgeschutzs, smoked in from the last turn, decided to remain in position, but not fire. 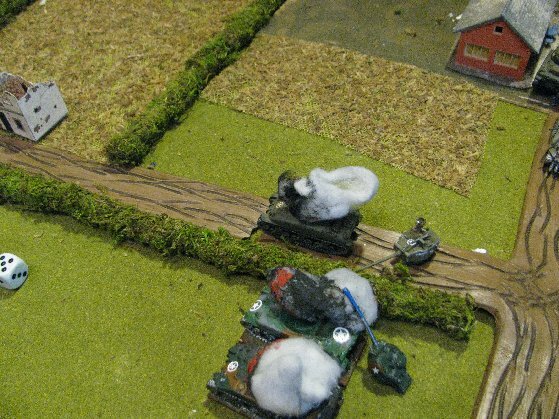 The 2iC Panther approached to short range, fired a shot at Troop ‘A’, “Gun Tanking” the Firefly, and bailed it. The Panthers in the center and south approached as well, and fired a collection of short and long range shots, bailing a Sherman from Troop ‘B’. Troop ‘A’s Firefly, despite a reroll, failed to remount their tank. The remaining Shermans fired at the Sturmgeschutzs. The Sturmgeschutzs were both “Gone to Ground”, and under cover, and long range, I needed 6’s to hit. This was mitigated by Semi Indirect Fire, but then the armor save for the Sturmgeschutzs was a 1 to kill, 2 to bail, and as such, were unscathed from the bombardment. Troop’B’s bailed tank remounted, and the all the tanks fired, smoking some Panthers, and pinging the rest. The CiC and the 2iC, in a brave move, drove to the flanks of two Panthers and fired. Rolling double 1s. German reinforcements arrive, another Aufklärungs Platoon. It positioned itself on the road, and ran 18 inches down it. In the north, the Panther and the Sturmgeschutzs continued to fire at Troop ‘A’, destroying one Sherman, bailing another. In the center, the first Aufklärungs Platoon continued down the road another 18 inches, taking them to assault range of the Rifle Platoon. 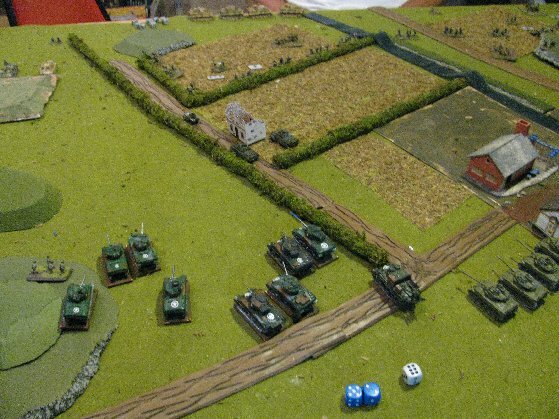 Between their halftracks, and the nearby Panthers, they fired some 21 dice of MG fire into the Canadian Rifle Platoon, but only pinned the Riflemen. The Germans then launched an mounted assault. 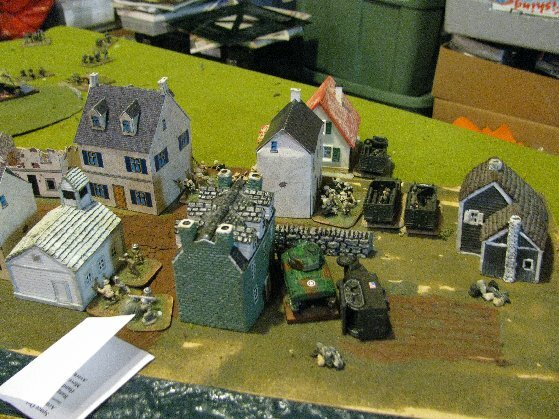 The Canadians had 5 shots of Rifle/MG fire, 3 hits, and two successful firepower checks, destroying a halftrack, bailing another, repelling the assault. In the south, the Panthers killed the Canadian 2iCm, Troop ‘B’s Firefly and bailed the CiC. Canadian reinforcements failed to arrive. 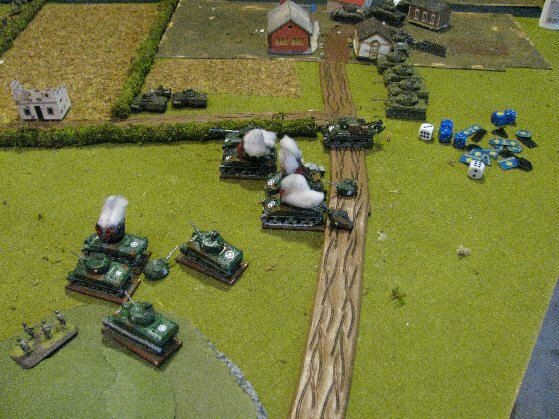 In the North, Troop ‘A’s Firefly continued to be bailed, so the remaining Shermans settled for smoking their foes, but must have run out of smoke ammo, as they all missed. In the Center, the Sextons had a good bombardment, destroying a Panther. In the south, the CiC bailed another Panther. 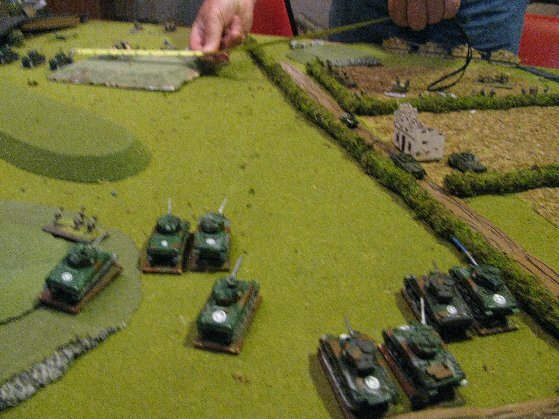 German reinforcements arrive, a platoon of Panzer IV J’s. They started on the southern edge, and taking advantage of a high ridge, double timed it to the center of the board. In the north, the Germans managed to destroy another Sherman. 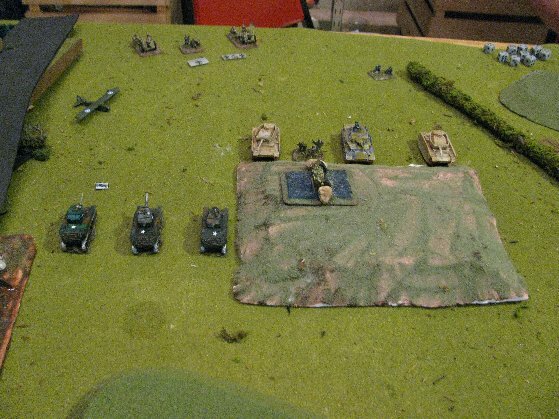 In the center, the Panthers and halftracks continue to rake the Rifle Platoon to little effect. 2 more mounted assaults, another halftrack and Panther burn in the process, killing a pair of Rifle teams. In the south, the Germans totally destroy Troop ‘B’, and the CiC, leaving only 2 Rifle teams from the Artillery to guard the South objective. Otherwise, some desultory shots from Troop ‘A’, to no effect. 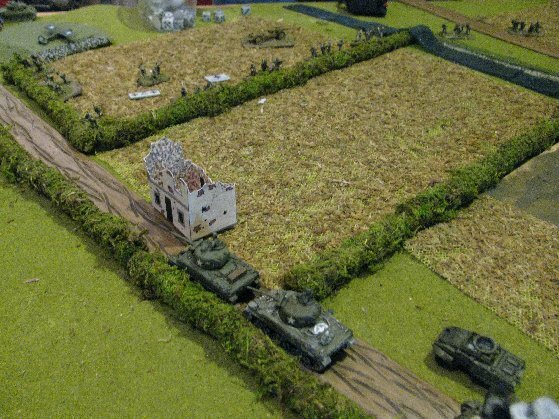 Around the center objective, the Canadian Rifle Platoon was again assaulted by multiple foes, as the first Aufklärungs Platoon focused on a single team, the second Aufklärungs Platoon on two teams, while a pair of Panthers took out a 4th team. The brave Canuks, reduced to just a Sergeant and a mortar team, surrendered the objective, but not the field. In the south, the CIC and one Panther assaulted two Rifle Teams of the Sexton Battery, squashing them like a bug, capturing the south objective. Canadian reinforcements arrive. The Tank Troop ‘C’ with 3 Shermans and 1 Firefly arrived in the north, and 2 M-10’s arrived in the south. 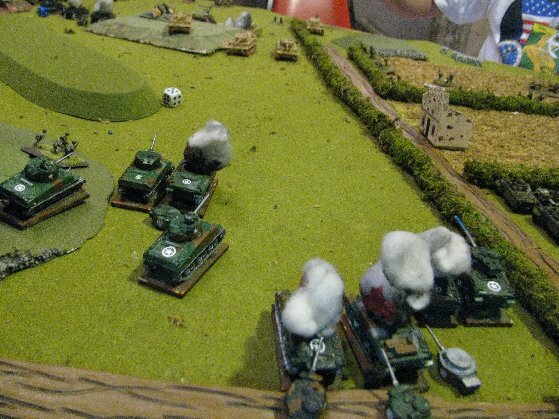 Troop ‘A’s surviving tanks left their ridge line and teamed up with the arriving Troop ‘C’ to gain 6 flank shots on the Panther Platoon holding the center objective. They bailed one Panther, destroyed another, forcing a motivation check, which the Panthers failed and fled. 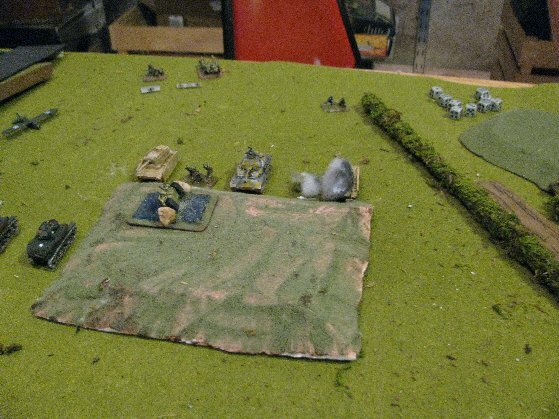 The M-10’s, hoping for a similar performance, put two flank shots in to the Panther Platoon holding the southern objective, killing another Panther, but the Germans held. All the while, 25 pounders pummeled the ground around the center objective, but only pinned the Panzer Grenadiers now holding it, so they continued to hold their positions. Leaving the Germans with both objectives, an easy win, 5-2. Motor Platoon of 4 MG teams. Each with 6 Rifle MG teams, and 1 SMG Panzerfaust team. SS Infantry Heavy Weapons Platoon with 2 15cm sIG33 guns. South side of the board. The village of Bourguebus adjacent to Hill 61. 4 by 6 feet. An asymmetrical setup. The narrow edges are North and South, the long edges East and West. The village of Bourguebus, is on the north edge. While the village itself is unimportant, holding it will put the allies in position to do a flank attack on the Bourguebus ridge, decoupling its defenders from the Verrières Ridge defences, which will then make the Falaise valley accessible. Hill 61 is in the north, and is the critical objective, from there heavy artillery can pummel the German SS units holding the Bourguebus Ridge. This scenario was set up to support WWPD's Operation Overlord Campaign and represents the Commonwealth assaults in lower Normandy region. July 25th, "Operation Atlantic", the Canadians were deployed south of Caen, their objective is the high ground on near the village of Bourguebus. From there the defenses of Verrières can be unzipped. In response, SS Oberstgruppenfuhrer Dietrich assembled a kampfgruppe from parts of 12th SS Panzer Division Hitlerjugend, Panzer Lehr, and recently arrived replacements destined for the 503rd Schwere Abteilung. South side of the board from the west edge. 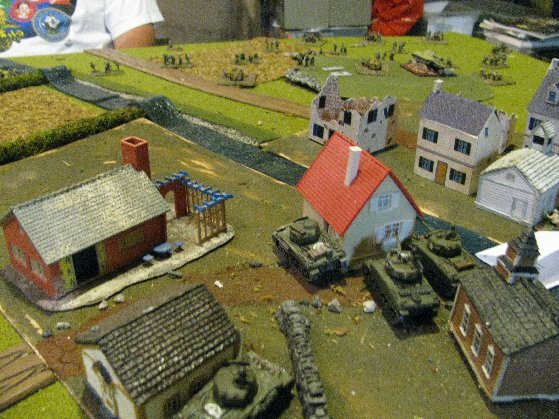 The Shermans of Troop 'B' and the Motor Infantry Platoon invest the village of Bourguebus. 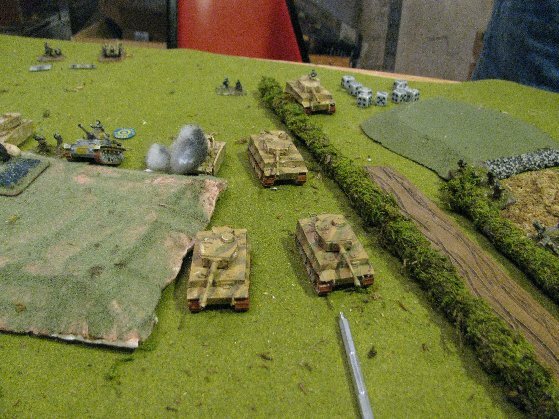 Defending Hill 61, is a Panzergrenadier Platoon, reinforced by PaK 40's. North side of the board from the west edge. Visible are the battery of Sextons, the Shermans of Troop 'B' and the Command Platoon. Off in the distance too the north, is a troop of reconnaissance Stuarts, and on the right, hiding in both bocage and ruined farm house is a troop of reconnaissance armoured cars. 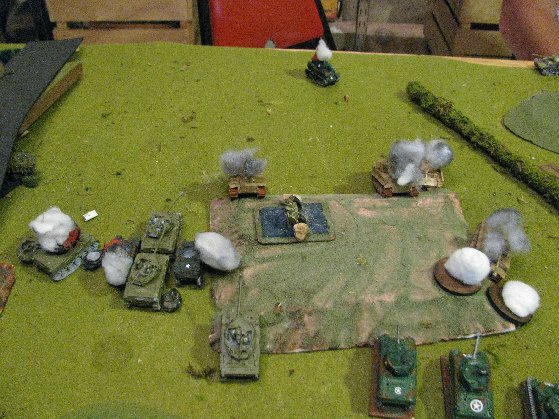 In the German Center, is a Platoon of Panzergrenadiers. On the left in hull down position, is the Ersatz Panzer Platoon, backed by a short battery of sIG 150's. The Tigers cannot be seen. The Germans are well deployed to defend Hill 61. 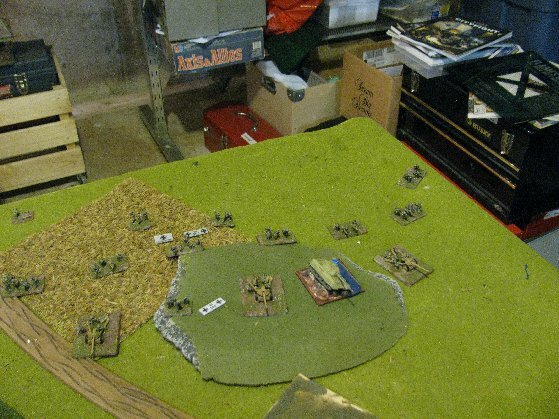 Between the Recon Move, and turn 1, the two reconnaissance units cut of all the best spots for an ambush. This is particularly important as that ambush is a platoon of 4 Tigers. The Lieutenant Idle's Minstrels raced up the left flank, while Dennis Moore's armoured car troop took the road up the center line. I decide to race for the northern objective. 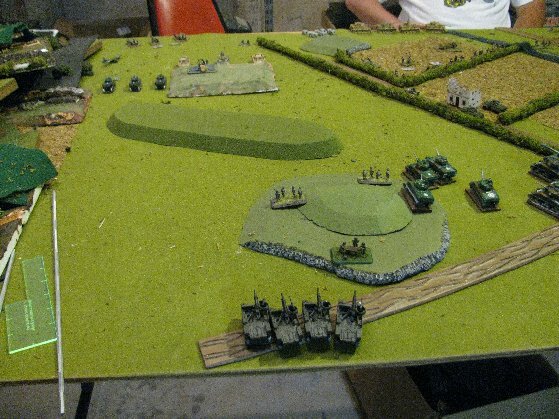 Only 3 tanks for defenders, plenty of bocage between the objective and anyone that would challenge it it seemed easy. The Stuarts raced ahead and shot up the sIG 150's, killing one, while the Shermans killed a Panzer III. The Armoured Cars were in a position to keep one of the Panzergrenadiers honest, as would Troop 'B' and the Motor Infantry in the village would keep the other one busy. But, due to sloppy placement, and lost perspective, there was a spot that was not covered all the recon teams zooming about. A spot big enough to drive a tank through it, more specifically 3 Tiger tanks, right next to the northern objective. The Tigers caused their usual havoc, killing 4 Shermans. The Ersatz Panzer destroyed 2 Stuarts. Both Troops passed their motivation though, leaving their remnants on the board. Most of the center is dominated by to platoons of Shermans. The armored cars spear point up the center. The M-10's stay in a noncommittal position to engage the Tigers when they are revealed. 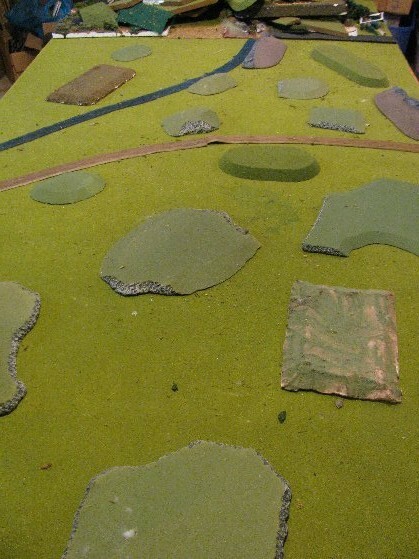 North edge of the board, the Stuarts engage the sIG 150's, killing one. One jeep is offered to the Panzergrenadiers, with two armoured cars covering it. 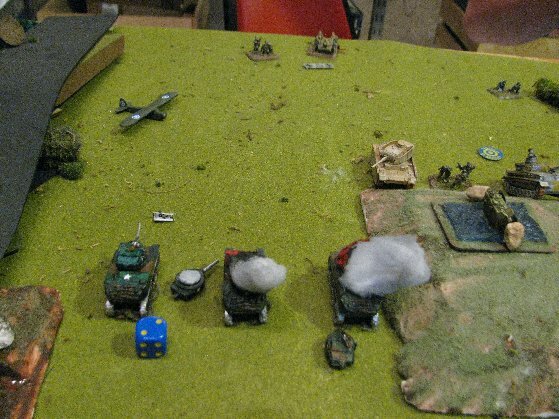 The Shermans also score an early kill. In the village, the peaceful village the half tracks sleep tonight. There is about a 6 inch hole that the recon teams are not covering. Just big enough for 3 Tigers to pop out of ambush! 5 shots from the 88's, 4 kills. 2 shots on the Armoured Cars and they fall back to regroup. 3 shots 2 kills from the Panzer III. Well, turn 1 was certainly eventful. 6 tanks traded for 1. 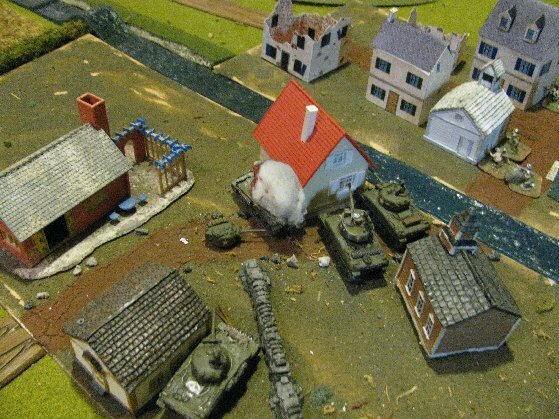 In Bourguebus, the Motor Platoon dismounted and started approaching the objective under cover of the buildings and the watchful eyes of Troop 'B'. The Shermans of Troop 'B' had lined up on a PaK 40, and gave it a couple of volleys, but to no effect. Lieutenant Idle, in his Stuart 'Sir Robin', skirted the Ersatz Panzer Platoon, and maneuvered to the flank of the surviving sIG 150. The subsequent assault, counter assault, reassault, and counter-reassault ended with the sIG 150 left standing, and 'Sir Robin', to beat a very brave retreat. Now that the Tigers were out, the M-10's double timed to the cover of the nearby hill, the idea was to approach the Tigers under cover of a hull down position on the hills. While two surviving Fireflies took their shots using "Semi Indirect Fire", hoping for a lucky hit. The Germans couldn't allow a 'Sir Robin' roaming their rear, and repositioned their Ersatz Tank Platoon and a Tiger to kill him in a number of nasty ways. And miraculously, he survived, bailed, passed motivation, and remounted in turn 3! In the south, the PaK 40 took a couple of shots and killed a Sherman, and the other PaK killed a section of the Motor Platoon. All were pinned by a barrage from the Nebelwerfers. The Motor Platoon dismounts and heads towards Hill 61. 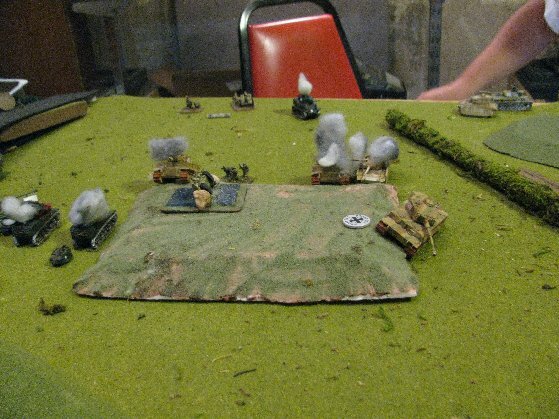 Troop 'B' takes a few shots at the PaK 40. Sir Robin sneaking away and buggering up. And what do we do with Shermans? Burn them! But, why do Shermans burn? Because they are made of wood! No pictures here. 'Sir Robin' tried again to kill the remaining sIG 150, and failed, and was subsequently had his eyes gouged out, his elbows broken, his kneecaps split and his body burned away. The M10's continued to motor around the ridge in the north to try to take on the Tigers one at a time from a hull down position. The Tigers, also took advantage of their hill for a hull down position. The Fireflys continued to fire, bailing a Tiger, but getting destroyed in the process. 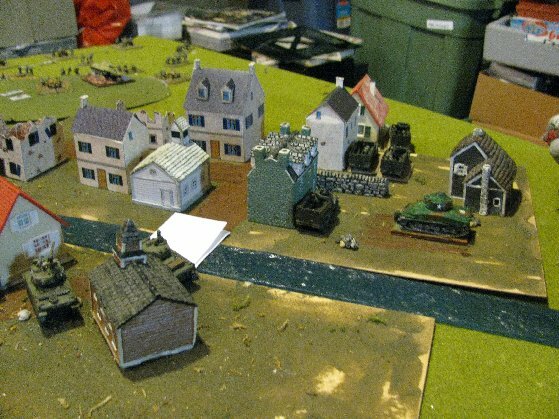 In Bourguebus, the Motor Platoon takes up positions in the buildings, while the Shermans of Troop 'B' evacuate to assist against the Tigers. Since this is "Fighting Withdrawal", the Germans pulled out the Nebelwerfers. 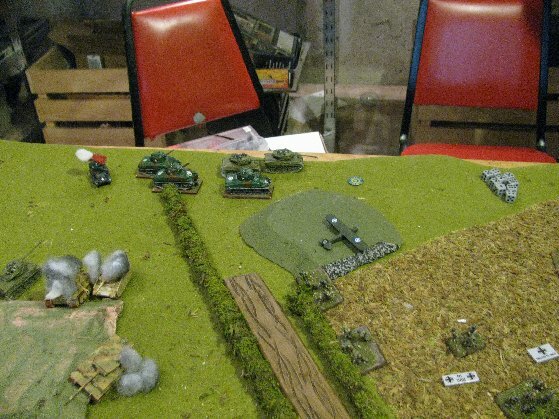 The M-10's assume their positions, contesting the objective, killing 2 Tigers and bailing a third. 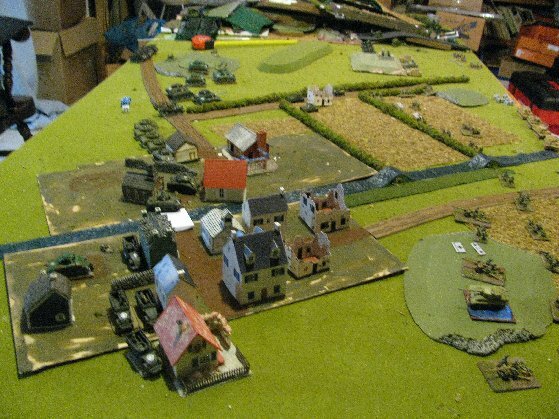 Only the German 2iC kept the objective in play. The followup direct fire smoke was not as lucky, as all the smoke rounds missed. Still withdrawing, the Germans pull out the sIG 150 battery. 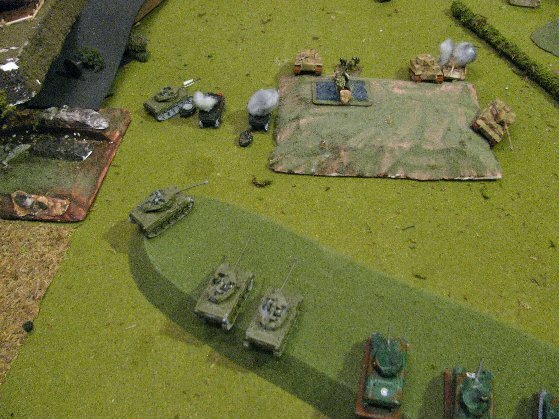 The Ersatz Platoon rolled around the hill, claiming an M-10. The Tiger in the bocage claimed a Firefly. Top of Turn 4. Sir Robin, and a Panzer III, are burning. 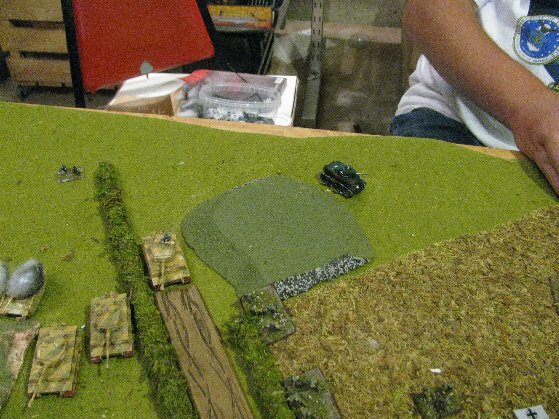 Three Tigers are hull down, one Tiger is in the bocage. At the top of the picture is the sIG 150 battery and the Ersatz Panzer Platoon. Between the Tigers is the German 2iC. This was about to become very important. The Nebelwerfers are not seen above as they have been withdrawn. The M10's are in position. The command Shermans are availble to smoke the surviving Tigers. Two Tigers burn, one is bailed! A Panzer III claims an M-10. But the Tigers only get a bail. The last of the Fireflys takes an 88. The M-10's finish their work, killing a third Tiger. The fourth Tiger failed motivation and fled the board. The German 2iC was killed, I don't recall how. The German withdrawl continued with the Ersatz Panzer Platoon. No Tiger replacements for the 503rd Schwere Abteilung. The Canadians launched a general charge capturing the northern objective, but it would be for naught. 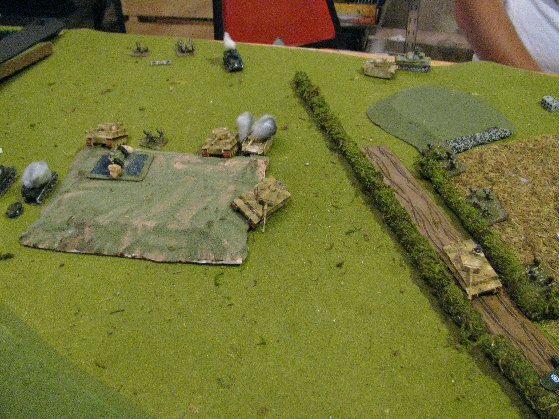 The Germans were allowed to remove that objective and stay viable. Through the fire and the smoke charge the M-10's. While the position is good, the timing is bad. If I don't capture the middle objective by turn 8, the defender wins. I could get to the objective, but that is all. This is a defender has a 5-2 win. 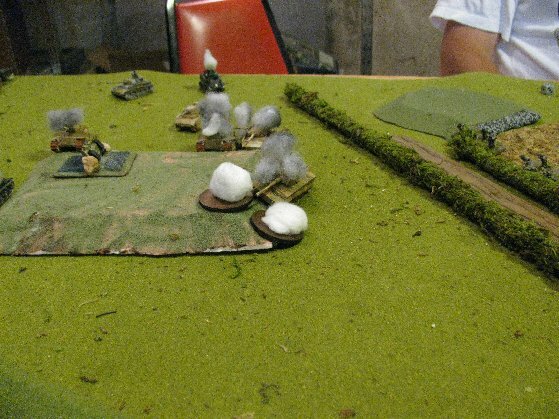 Charge continues around the flank of the bocage and the Panzergrenadiers. But it is too late. Troop 'B' motors up the bocage lined road, supported by Dennis Moore's armoured cars. Remember the primary missions, especially early on. I lost this game on turn 1. I had it, but I instead yielded to temptation to get a cheap kill. I concentrated my Stuarts to shoot up the sIG's. Instead I should have spread them out to prevent the Tigers from appearing on that side of the board. In the end they accomplished neither the destruction of the artillery, or scouting out the ambush. 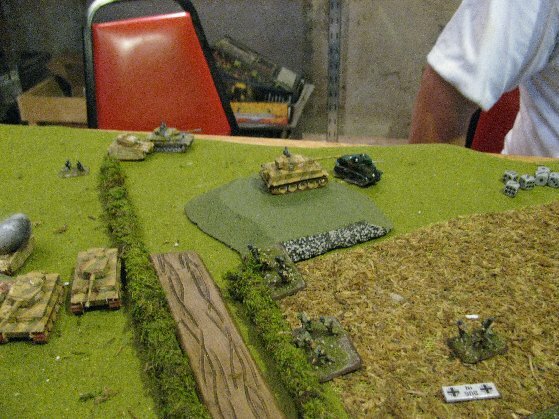 With the Tiger ambush out of place, I could have easily overwhelmed the Ersatz Panzer Platoon and secured the objective .